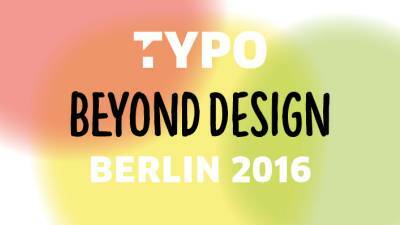 The 2016 TYPO Berlin International Design Conference: Beyond Design had a promising title and did not disappoint. A wide variety of speakers, made up of pioneering designers, professors, academics, artists and more, shared their knowledge and experiences with attentive, design-centric audience members (like us!). While some presentations were on the wacky side, like Spanish brothers and illustrators Brosmind, who crafted their presentation hardware out of wearable Lego armbands, some took a more serious tack. Regardless, you’d be hard pressed to exit the conference halls without taking some inspiration with you. The nerd in us appreciated the presentation given by Nadine Chahine, a type designer working as the UK Type Director and Legibility Expert at Monotype. Her presentation covered designing for split second clarity. In certain high-stake situations, the legibility and the speed with which we take in written information becomes all important, such as in the use of automotive or medial human-machine interface devices. How to maximize this speed, according to Chahine, depends not only on the choice of typeface but on a set of many other variables and how they interact with each other. Typeface is an ingredient in a much larger mix. Her research has taken the subjectivity out of these decisions by quantifying the effect of typeface and their interactions with environment, medium, polarity, size, distance, color, weight, kerning and among other things. The results were surprising and impressive. Altering just one slight variable can improve or decrease the percentage of speed and legibility in the double digits. Chahine also stressed the need to test legibility on a wider range of age groups, as visual acuity tends to decrease with age. We are bombarded with information coming at us from all sides and the more we know about how to formulate that information for specific purposes, the better off we all are. Typography. When used right, it can save your life!